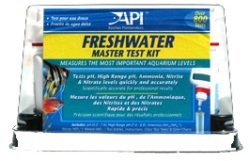 This kit tests tap water and aquarium water for five different parameters that affect the health of freshwater fish: pH, High Range pH, Ammonia, Nitrite and Nitrate. Highly accurate and economical. Unique, transparent dome allows clear view of contents. Includes all tests required to test the nitrogen cycle. Kit includes computer-calibrated and laminated color cards, 4 glass test tubes and holding tray.